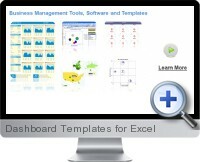 The Excel Dashboard templates consist of 10 professionally designed plug and play Excel dashboard template reports. Each dashboard prints on one page at high resolution for executive reporting and publication. The dashboard templates update automatically as data is entered, copied or updated from dynamic links to data sources. Use the templates to customize or copy for creating new dashboards to meet reporting requirements. Business insight reporting is based on a 13 month scale to track performance metrics key performance indicators (KPIs) and trends over a one year period. Dashboards can be geared for executive reports, financial analysis, sales performance, operations management, marketing scorecards and other business analysis reporting. High quality one page print setup facilitates quick and easy dashboard publishing. The Excel dashboard templates include free lifetime product updates and access to tools and information on dashboard reporting best practices.